The asbestos house of cards built on denial, distortion and distraction1 is collapsing. With more and more evidence documenting the toxic effects of human exposures and action being taken the world over to protect populations, preliminary data for recent years have shown a dramatic fall in consumption and reports from the asbestos frontline have documented a waning of industry influence and power even in home markets. Roll on nearly a decade and it seems that although the arguments remain the same, the packaging has changed. 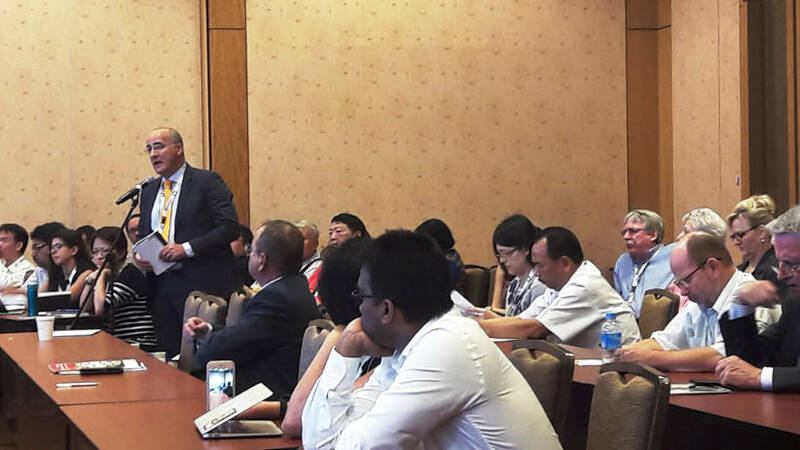 During the ITUC Symposium on Trade Unions and Occupational Health and Safety: Fighting for the living on September 6, 2017, a delegate disputed the content of a presentation by Australian trade unionist Dr Deborah Vallance entitled: The fight for an asbestos-free world. Dr Deborah Vallance, ITUC Symposium September 6, 2017. Phillip Hazelton, Campaign Coordinator for the Elimination of Asbestos-Related Diseases for Australias Union Aid AbroadAPHEDA, identified the critic as lawyer Emiliano Alonso, partner and director of Alonso Asociados, a Brussels-based public relations company.13 Mr. Alonso has represented the International Chrysotile Association for a number of years. I first came across him in Geneva at the 2013 meeting of the Rotterdam Convention. 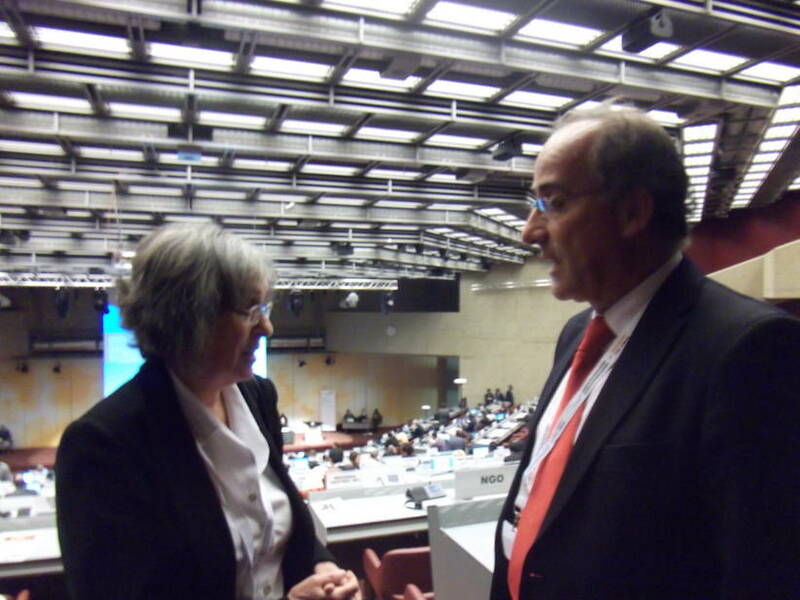 Laurie Kazan-Allen speaking to Emiliano Alonso during the 6th Conference of the Parties to the Rotterdam Convention, Geneva, 2013. During the question and answer session of the ITUC Symposium, Alonso and Selyanin, the sole reminder of the bloated 2008 asbestos industry posse, objected to the anti-asbestos propaganda presented by panelists, urged evidence-based decision-making, asserted that no cases of asbestos-related diseases had been identified in Russia and that 80% of the world still used chrysotile asbestos; blaming exposures to other forms of asbestos  amosite and crocidolite  for asbestos-related diseases, they maintained that the use of chrysotile asbestos was safe. Emiliano Alonso asking questions during ITUC Symposium September 6, 2017. What the asbestos industry has so long feared has come to pass. Formerly isolated individuals and organizations from around the world have come together to progress the campaign to ban asbestos using the latest technology and platforms to disseminate their message. In a letter of September 2, 2017, the Occupational Health and Environmental Health Network of India (OEHNI) urged the Chief Minister of Gujarat to carry out rehabilitation work in flooded areas with the use of asbestos-free materials for the protection of health of our people. Doing so, OEHNI Coordinator Jagdish Patel pointed out, could set a precedent for other states and reconfirm the progressive status of Gujarat.22 Recalling Ms. Giannasi's prophecy that: the asbestos industry will survive only in dictatorships it is worth remembering that India is the worlds largest democratic country. Maybe it will be the next one to ban asbestos? The struggle continues. 1 This expression was first seen in an article by Denis Campbell entitled: Alcohol firms distorting link with cancer. September 8, 2017. 2 WHO. Chrysotile Asbestos. 2014. ILO. Resolution concerning asbestos, 2006.
WHO. Elimination of asbestos-related diseases. 2006. 4 Odgerel, CQ, et al. Estimation of the global burden of mesothelioma deaths from incomplete national mortality data. September 2, 2017, Occupational and Environmental Medicine, Epub ahead of print. 6 Eternit SA (ETER3) Plunged -1.71% on Aug 29. 7 Instituto Brasileiro de Crisotila (Brazilian Chrysotile Institute). 8 Kazan-Allen L. Ban Asbestos Update: Summer 2017. July 20, 2017. Vietnam General Confederation of Labor. Press Release. July 21, 2017. Press Release Calling for Asbestos Ban in Indonesia. July 28, 2017. 9 Below are links to coverage of Summer 2017 asbestos events in Asia. 11 Kazan-Allen L. Defending the Indefensible. August 16, 2008. 12 Selyanin D. Prospects of the Global Chrysotile Ban. 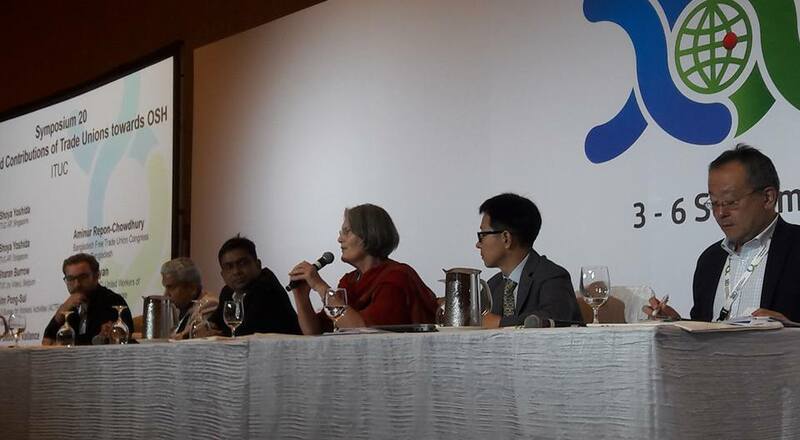 XVIII World Congress on Safety and Health at Work  Global Forum of Prevention. Book of Abstracts. Page 27. 2008. 14 From information received, along with Alonso (Spanish) and Selyanin (Russian), there were industry supporters from India, Sri Lanka and Thailand. 15 Open Letter to President Minnikhanov. September 1, 2017. 16 Минниханов — минтрансу: «Г..…е дороги делаете!» [Minnikhanov vs. The Ministry of Transport]. a 26% fall in global consumption from 2,026,921t (2015) to 1,497,943t (2016). 18 Страшилки про асбест. Мифы и правда [Horror stories about asbestos. Myths and truths]. September 4, 2017. 19 Lab Rats: The anatomy of deadly product defence campaigns. Hazards. December 2013. 20 Zim to resume asbestos production. September 9, 2017. 21 No suitor for Shabanie and Mashaba Mines. June 16, 2016. 22 Letter to Chief Minister of Gujarat, India. September 2, 2017.